In Houston Voluma injections are a hot topic. Here are ten of the most frequently asked questions about Juvederm Voluma XC, commonly known as Voluma. Juvederm Voluma XC is the newest HA (hyaluronic acid) soft tissue filler to gain FDA approval to instantly add lift to the cheek area in patients over the age of 21. It is commonly referred to as Voluma. HOW DO I KNOW IF VOLUMA IS RIGHT FOR ME? To learn if Voluma is right for you, Dr. Kridel or Dr. Sturm will perform a thorough consultation. They have extensive experience with the wide array of different fillers and wrinkle relaxers and will select the best treatment plan for your specific needs. WHY DO PATIENTS CHOOSE DR. KRIDEL AND DR. STURM FOR THEIR VOLUMA INJECTIONS? At Facial Plastic Surgery Associates Voluma treatments are performed by one of our physicians ---- Dr. Russell Kridel and Dr. Angela Sturm. As top facial plastic surgeons in Houston, Dr. Kridel and Dr. Sturm are considered leading experts in facial fillers. They customize treatments for each patient, which may include a combination of different fillers and techniques in order to achieve the best outcomes. Dr. Kridel is always on the leading edge of aesthetic treatments and as a result, Facial Plastic Surgery Associates is one of the first cosmetic medical practices in Houston to offer Juvederm Voluma XC. WHO IS A CANDIDATE FOR JUVEDERM VOLUMA INJECTIONS? Virtually anyone 21 years or older with volume loss in their cheek area is a candidate for treatment with Voluma. Many patients in their 30s, 40s, and 50s may not be appropriate candidates for surgery, or are not ready for downtime associated with surgery and will benefit instead from Voluma treatment. IS THERE ANY DOWNTIME AFTER VOLUMA INJECTION TREATMENT? There is no downtime after treatment, and patients may return to their normal activities. However, we suggest that you avoid strenuous activities in the first 24 hrs after Voluma injections or other injectable treatments. HOW LONG DOES VOLUMA INJECTIONS LAST? Results are immediate and can last up to 2 years. The duration of filler correction depends on the facial area treated, the injection technique, and the rate that the patient ‘s tissues break down the filler. The majority of patients can resume their daily activities immediately after treatment. Some patients may experience slight swelling and bruising, but this typically improves rapidly. WHAT ARE THE SIDE EFFECTS OF VOLUMA INJECTIONS? Side effects include are considered mild to moderate and can last two to four weeks. The most common side effects are tenderness swellings firmness bumps bruising redness itching or discoloration at the entry site. WHAT IS A HYALURONIC ACID? Voluma is made up of hyaluronic acid (ha), which is a naturally occurring substance that helps to bind water to cells. Its extensive cross-linking helps to provide lifting capacity, which makes it an excellent choice for restoring volume in the cheeks and midface. Juvederm Voluma is unique in that the HA is cross-linked through a process called Vycross that helps provide good lifting capacity. This special cross-linking also helps to avoid degradation, making Voluma last longer. HOW IS VOLUMA DIFFERENT FROM SCULPTRA? Voluma is an injectable filler made from hyaluronic acid. Sculptra is not a filler. It is made of Poly-L-Lactic Acid (PLLA), a synthetic biodegradable polymer that is both resorbable and bio-compatible. It works by stimulating the body to produce new collagen at the sites of injection, thereby replacing lost volume and contours to restore a fuller, more youthful appearance. Houston Sculptra injections do not give immediate results like the true fillers do. Since Sculptra has to stimulate the body to create new collagen, this process takes time. Sculptra can last at least two or more years because it causes the body to stimulate its own collagen. Two to three sessions generally 4-6 weeks apart are usually needed to accomplish optimum volume. IS VOLUMA PART OF THE BRILLIANT DISTINCTIONS PROGRAM? 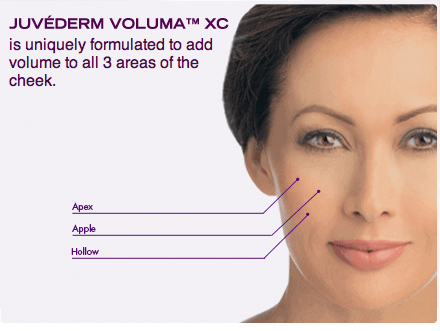 Voluma is made by the same company that manufactures Juvederm XC, Latisse and Botox--- Allergan, Inc. So, yes, this is part of the Brilliant Distinctions Program. To make an appointment with Houston facial plastic surgeon Dr. Kridel or Dr. Sturm phone us at 713/526-5665. Feel free to contact Dr. Kridel or Dr. Sturm also.